Just when everything seems to be going right in Toby's world something, or in this case someone, has to come along and ruin it. Toby should be focusing on planning her wedding but an unexpected, and not particularly pleasant, visit from Amandine turns her life upside down and leaves her with an impossible task on her hands - track down Amandine's oldest daughter, August, who has only been missing without a trace for about 100 years, or both Tybalt and Jazz will pay the price. Failure isn't an option but Toby is going to have to pull out all the stops, including working alongside her sworn enemies, if she wants to have a chance at succeeding. Amandine has been pretty much a minor character in the series so far, we know she's a firstborn and we know she's Toby's mother (and a pretty crappy mother at that!) but apart from the occasional brief appearance we've not really seen much of her so I was quite excited at the prospect of getting to know her. Well you know that saying "be careful what you wish for"? That definitely applies here because Amandine is so much worse than I could ever have imagined and I felt so badly for poor Toby for everything that Amandine puts her through. The Luidaeg may be Toby's aunt but she's been more of a mother to her than Amandine ever has or will. So Toby's family reunion doesn't go well and now she's been set with the impossible challenge of finding her half sister or being responsible for the death of her fiancé. Toby is nothing if she's not determined but I have to admit the lengths she was willing to go to surprised me here, she has to go to the one person I didn't think she'd ever trust for assistance and it makes for really interesting dynamics in this story. It's hard because there are so many things I want to discuss in this review but all of them would be spoilers so I can't talk about them. What I will say is that the stakes are higher than ever, the risks are greater, Toby's life is in danger and things will never be the same again. 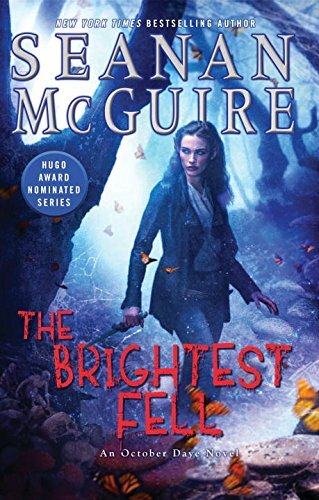 The Brightest Fell was everything I could have hoped for and then some, Seanan McGuire somehow manages to ramp up the level with every new book in this series and it has quickly become one of my favourite UF series of all time. I can't recommend these books highly enough and I'm desperately waiting for the next book to release.